Third times a charm — How Sweet! 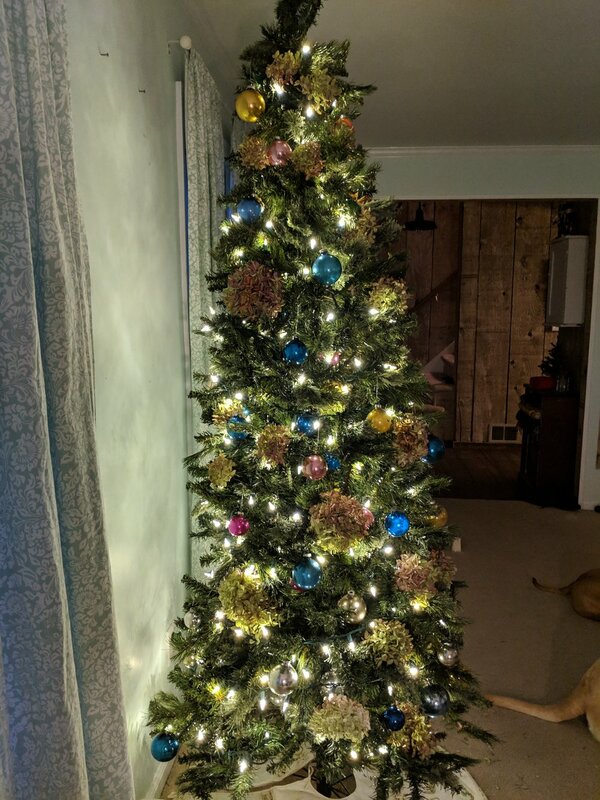 Jaysen and Julia set up our skinny tree the other day and I realized that all of the ornaments and trim that we had for it was previously sold at one of our yard sales. I would have loved to buy all new ornaments, although it would have been really hard to narrow down a style (gosh I just love it all!!). I remembered my box of dried (read: dead) hydrangeas that were still sitting in the garage and thought I’d use them on/in the tree. I mean, why not? It still doesn’t feel right to just toss them out into the compost - so I might as well get as much use out of them as I can. On Small Business Saturday, the mister and I visited some of our local shops and I grabbed a few bags of vintage ornaments for $3.00 per bag. I had spotted them a few weeks ago and had talked myself out of buying them then. Do you do that? Of course, I couldn’t stop thinking about them afterwards and I was certain that someone would have grabbed them up at this point. But, there they sat, waiting just for me!! I love the colors and the age spots, they add so much character and is such a beautiful reminder of days gone by. I wonder, how old are they, how many places did they call home, were they handled by little hands? Did they sit in their box waiting until Christmas Eve to make their debut or were they a part of the entire holiday season? I will never know their history, but I do know that they are cherished right now. As a little girl, my family and I would wait until Christmas Eve before decorating our tree. Before bed, I was allowed to put the first ornament on the tree and had to leave the rest for Santa. I’m sure as I got older that tradition changed a bit. I feel like the tree could still use a little something, but I don’t quite know what that is yet. We also need a topper but I have a feeling it’s going to stay exactly the way it is right now - and I’m okay with that. 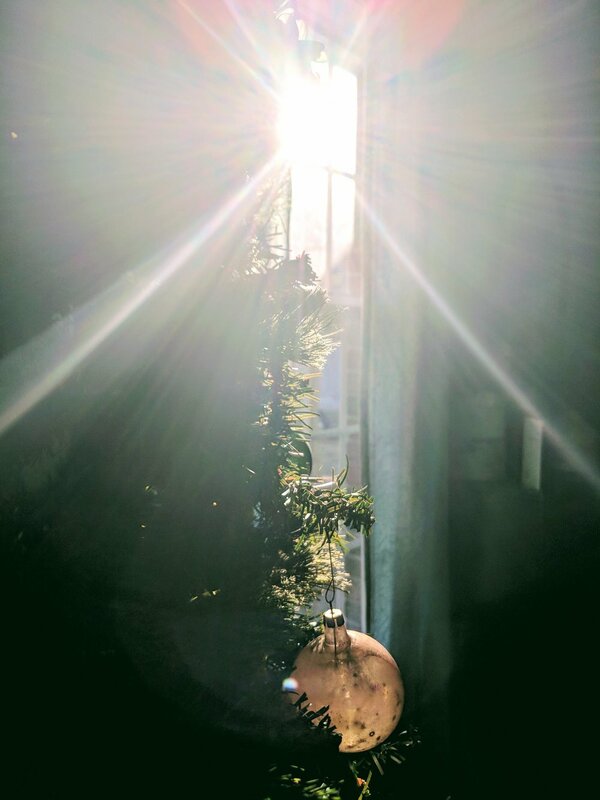 I am loving the reflections that are bouncing off of the ornaments, from the sun streaming in or the twinkle lights, it’s just beautiful!! Oh let me share one word of caution on using dried flowers on your tree. 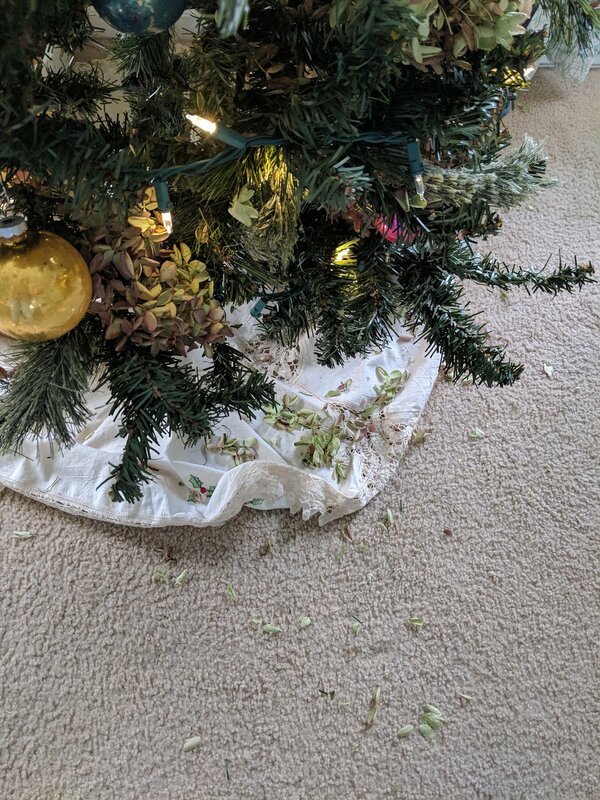 If you have large dogs with big, wagging tails, you may not want to use dried flowers, unless of course, you’re okay with this happening ….I guess I should have thought that through a little more. What were your childhood traditions? I’d love to hear them! !